Washington, D.C. — Real Salt Lake ended Saturday night's contest against D.C. United with significantly fewer players than they began the game with. Jefferson Savarino was shown a red card for raking Luciano Acosta's face in the first half, and then Marcelo Silva picked up a second yellow for hauling down Lucas Rodriguez in the second half. That made the night easier for the Black-and-Red, as the hosts ran away with a 5-0 victory thanks to a Wayne Rooney hat trick. Rooney added an assist to Lucas Rodriguez's wonderful volley in the second half, before Ulises Segura rounded out the scoring in the 81st minute. United got to seven points from their first three games of the season with the win, having yet to concede a goal. But the star of the night was undoubtedly Rooney, who scored his first three goals of the MLS season for his first hat trick since his move to the USA. 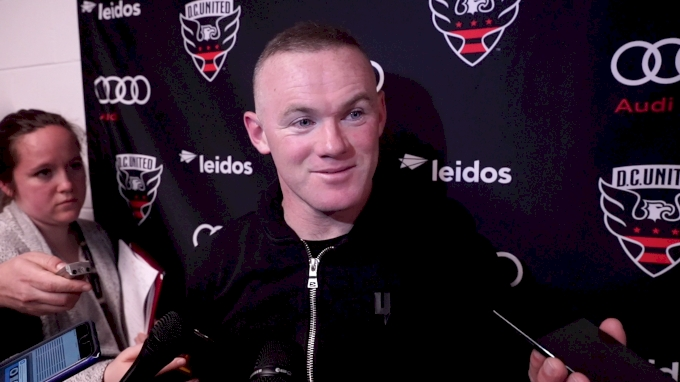 "To score a hat trick is always great," Rooney told reporters outside the locker room after the game. "We were clinical, apart from my header that I missed." The header that Rooney missed was a chance earlier in the second half for Rooney to complete his hat trick. Uncharacteristically, after slotting home a penalty and chipping a second goal past Nick Rimando in the first half, Rooney couldn't divert his header on target in the 54th minute. Rooney wasn't to be denied, though, on a night he produced 11 of United's 22 shots, to go along with an assist and four other key passes. A slick passing move from Luciano Acosta to Junior Moreno allowed England's all-time leading scorer to slide home his crowning goal halfway through the second half. "I’m pleased with the team. It was a great victory for us," added Rooney. "After preparing in preseason, and knowing we had three games before the first break, to come away with seven points is a good tally for us." Rooney had already scored twice in the first half when Savarino got his marching orders in first-half stoppage time. By the time Rooney completed his hat trick, Silva had already hit the showers early, picking up his second yellow card, with his first coming when he conceded the penalty after stomping on Paul Arriola. So while the victory was great, United won't take too much from the night, given how easy the game became for them in the second half, when they had a two-man advantage on the field. "I think we have to make sure we understand that we have to stay humble," Ben Olsen said after the game. "We were able to be the better team in the first half, and then the red cards change things. It was a mature second half in the way we went about it." United now have a week off for the international break, which sees Arriola, Moreno, and Chris Durkin depart. When United play again in two weeks on the road against Orlando City, they will look to continue their shutout streak, which is at 270 minutes so far this year. "Defensively, we have a good group that holds each other accountable," said Olsen.